Product prices and availability are accurate as of 2019-04-20 06:44:42 UTC and are subject to change. Any price and availability information displayed on http://www.amazon.com/ at the time of purchase will apply to the purchase of this product. 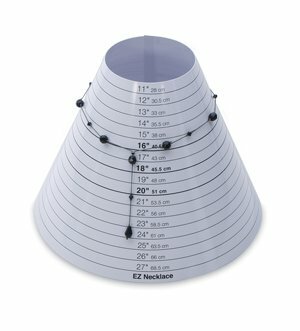 EZ Necklace Sizer is a must for every beader. Make necklaces fit the first time every time. No more restringing, wasted beading wire, wasted crimps, or wasted time. Made of heavy roller polished vinyl for years of use. Lightweight and easy to take with you everywhere. Shipped flat, easy to assemble. Measures sizes 11" up to 27".